The newsstands are getting more and more sparse with the magazine selections, but MagMall offers a large selection of magazines in every category that's ever graced the racks. MagMall has been around in one form or another since 1984, but the online side of this company provides one of the largest selections of publications around. 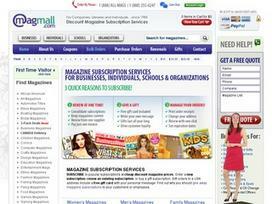 MagMall offers magazine subscriptions for many different entities. In addition to individual subscriptions, MagMall also provides services to schools, businesses and others who use magazines. MagMall offers quite a few advantages compared to simply subscribing to a publication through the magazine directly. All of the subscriptions that run through this retailer can be combined into one subscription payment, so none of the customer's subscriptions lapse due to not knowing when to renew. Plus, all of the renewals are taken care of at the same time. Gift subscriptions are also available through the MagMall website. Getting account numbers and other important information about a subscription is also handled through the MagMall website. MagMall provides competitive prices on subscriptions in many cases, so a financial incentive also exists to pick up magazines through this site. Dozens of categories are available, from art to women's. Most popular magazines are found within the company's offerings, while countless other smaller-run publications provide access to special niche magazines that may have never hit larger newsstands. MagMall frequently has coupon codes as well as discounts, so a customer can potentially save even more money on a particular subscription. Bulk orders are also available, although MagMall needs to provide a price quote directly on those types of orders. The site is divided up in to the different type of subscriptions, so individual would look through a different section than a business. MagMall also provides purchase orders for companies and organizations. In addition to traditional magazine categories, many different types of comics and 3-pack value subscriptions are available. Many magazine subscription sites gloss over comics, so it's great to have this available through MagMall. MagMall has been around for a long time, so it has a great deal of experience in providing a solid magazine subscription service. Many features that a customer could want out of a magazine subscription are given in one handy format, and new magazines are added all the time. MagMall estimates over 4,000 different types of magazines in its collection, so chances are good that the magazine you're looking for is available. The online ordering process makes it easy to purchase multiple subscriptions, and the subscription management features are hard to top. MagMall bills itself as a one-stop shop for all of your magazine subscription needs, and it seems to be doing a good job at positioning itself to be so. Share what you think about MagMall, and your favorite ways to save there!